However, Just Costs Solicitors was one of the named creditors of Roberts Jackson Solicitors, the industrial disease firm which entered into administration in October 2018 and was subsequently purchased by acquisition vehicle, AWH Legal. 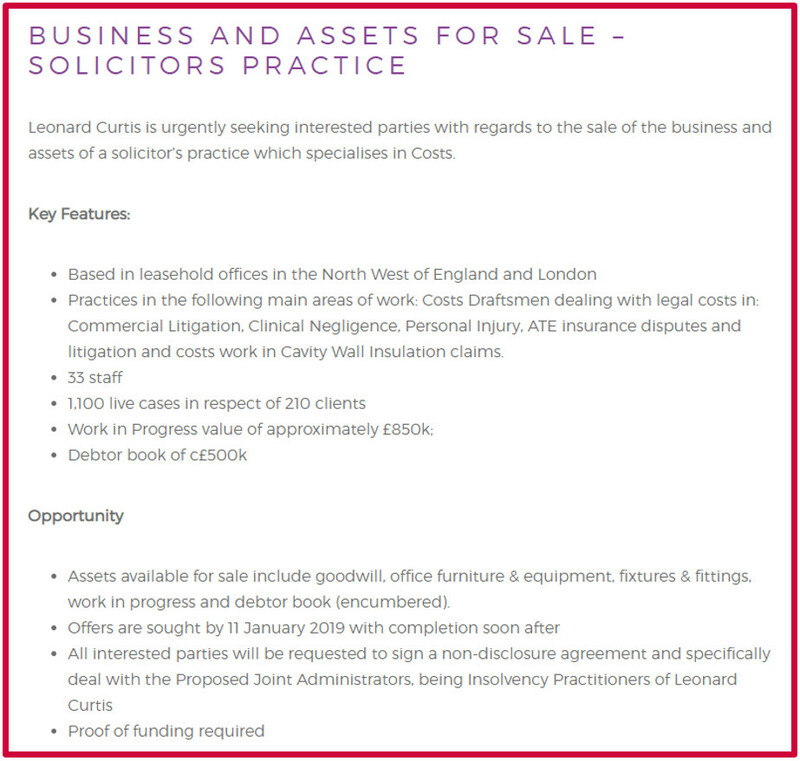 A creditors’ report, published in November 2018, predicted that Just Costs Solicitors was unlikely to recoup any of the £33,000 owed. It is now believed that this advertisement was promoting Just Costs Solicitors. [i] John Hyde, ‘Rescued legal costs firm goes back into administration’ (28 January 2019 Law Gazette) <https://www.lawgazette.co.uk/practice/rescued-legal-costs-firm-goes-back-into-administration/5069046.article> accessed 28 January 2019. [ii] John Hyde, ‘Just Costs reborn as firm sheds 'substantial' debt burden’’ (27 October 2017 Law Gazette) <https://www.lawgazette.co.uk/practice/just-costs-reborn-as-firm-sheds-substantial-debt-burden/5063456.article> accessed 28 January 2019.